Analyzing the Healthcare IoT: How Safe are We? Gone are the days where the Internet of Things (IoT) used to be in the nascent phase. Today, the healthcare industry has seen 11 percent of the rise in IoT network connections between 2016 and 2017. Although IoT device offers various benefits for healthcare organizations, several major concerns revolve around them regarding the implementation of IoT such as standards, security, interoperability, and cost. 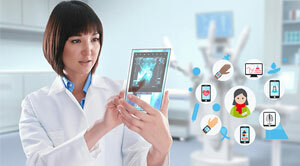 Healthcare providers need a measure to remain proactive as most of the connected devices are tied with limited security and patching vulnerabilities, making IoT soft targets for cybercriminals. Organizations and institutions in the healthcare industry have its reasons to use IoT. For instance, the pharmaceutical industry successfully leverages IoT solutions to track drugs through the supply chain. On the other end, a hospital with an immense complexity might utilize a smart community application to track assets, inventory reconciliation and personnel. Speaking of high costs, it is hard for healthcare organizations to find one-size-fits-all IoT solution. In such situation, solutions are modified to address specific challenges, which can cost a fortune for any organization. Security is considered as the priority for every organization. Because of the limitation in the security standards, adoption of IoT has been impacted, while exposing sensitive healthcare data against security risks and threats. By incorporating a tailored approach along with a proper security plan, organizations can protect and secure each solution. Interoperability is another primary concern hindering the implementation of IoT. The complexity of information systems leveraged within healthcare has made the integration of the data a tedious process. With the help of IoT, healthcare staff can successfully transfer the sensitive patient data to multiple devices. IoT platforms will become more seamless and streamline when it comes to the deployment of applications, providing developer’s a simplified access to new tools and resources for IoT use cases. Also, in the coming future, there will be the ongoing consolidation of the IoT market space.